Designing and building a PWA configuration is the very first task you are facing when starting with Microsoft Project Online and, over time, its complexity gets quite significant. The reason is the number of configuration elements: multiply the number of fields by the number of PDPs, then by the number of project types, and then add the dimension of use. We’re talking about dozens of places to look for this information and hundreds of possible variations. Additionally, if the configuration has been done manually, most likely it contains typos, mistakes, and orphan elements. Maintaining it is a complex job, and that’s why we have a Configuration Audit feature in our FluentPro G.A. Suite – to help organizations clean up their configurations and make sure they’re optimized and high-performing. FluentPro G.A. Suite discovers and highlights all the data inconsistencies that are in your configuration, all the orphan elements, and the fields that are not utilized properly. By highlighting all the configuration flaws, G.A. Suite hands you a plan for cleaning up your configuration, removing fields that are not being used, and updating PDPs and views in your system. All these adjustments will eventually have a direct impact on system performance and data consistency for your users. Configuration Audit wizard is designed to keep track of the PWA configuration usage: Custom Fields, Lookup Tables, Enterprise Project Types, Workflow Stages, Project Templates, and Project Detail Pages. To start the wizard, click File → Wizards → Configuration Audit. 1. Select “In current workspace”, in case your workspace already contains a downloaded configuration. 2. Select “From file”, in case you saved the workspace file with the required configuration on your machine. Specify the path to the G.A. Suite workspace file. 3. To allow the wizard to download the required entities, select the “From PWA” option. 4. Specify the source PWA URL and login credentials. 5. Allow G.A. Suite some time to perform the audit. 6. Once G.A. Suite completes the audit, you will see a pop-up window. Click “Yes” to open the file with the results. 7. Results will be displayed on several sheets in the generated Excel file. 1 – Let’s start with the “Enterprise Project Types” tab. This section will list all the enterprise project types (EPTs) that you have selected in the PWA and will show if there’s any attention needed for each one of them. The “attention needed” criterion is whether this project type is used in a project or not. The logic behind this is that if you do not have any project associated with this EPT, chances are you don’t need it and it is just taking up space. 2 – In the “Stages” tab, G.A. Suite will generate a table with workflow stages and the projects that are in those stages. If you have workflow stages that have no projects, they may be candidates for deletion. 3 – The “PDPs” tab will show if your PDPs are being used in the EPTs, and in which stages. This tab might come in handy in situations where, for example, your company has a policy that requires that all projects use a workflow. In this case, this tab will show you the PDPs that might have been missed. 4 – The “Lookup Tables” tab. The system will check if there are any values for a lookup table in the list, whether it is connected to any field, and whether it is being used in any project. Again, if a lookup table has no values, you might want to eliminate it. 5 – The “Fields” tab will show whether the fields that you have are being used in PDPs, views, and projects. Automated fields auditing is especially valuable since companies typically have hundreds of fields and need an easy, fast way to detect any data inconsistencies and orphan fields. 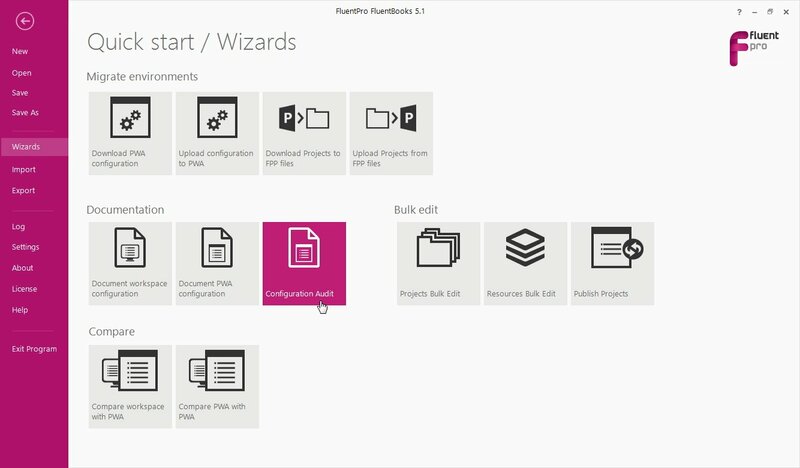 6 – On the “Project Templates” tab, the system will show which templates are in use. This is important since companies often forget to delete templates that are no longer being used but are still taking up space. 7 – The “PDPs vs. EPTs” and “PDPs vs. Stages” tabs show in which EPTs/Stages the projects are being used. These tabs help find orphan PDPs that are not being used anywhere and can most likely be safely deleted. 8 – The “Fields vs. PDPs” tab allows you to see the consistency of data across multiple elements in your environment and highlights candidates for removal. 9 – The “Fields vs. Views” tab shows how fields are used in views so you can decide whether certain fields should be deleted or added to the views and whether certain duplicate views can be removed. To summarize, G.A. Suite is an essential tool for optimizing Microsoft Project Online configuration and ensuring data consistency and standardization across all projects and portfolios. Configuration Audit highlights all the inconsistencies and brings to your attention the data in your PWA that is not being used anywhere so you can identify orphan fields and clean them up to optimize performance. For more details or to schedule a demo, please contact the FluentPro sales team. To learn more about other features of G.A. Suite – please check the G.A. Suite homepage.